Creative writing is a great way to keep their brains active this summer while still having fun. Try out these games to get their inspiration flowing. These games are good for all kids from the time they can write their ABC’s to their teens. 1. Get artsy and go to a museum. Tell the kids to pick their favorite painting and to write a story about what is happening inside. 2. Provide them with two objects to describe. Ask them to write a paragraph about each in as much detail as they can. Finally, ask them to find the connection between the two. You’ll be amazed at what they come up with! 4. If you have an adventurer on your hands, this activity will spark their interest. First, they choose the conflict. Whether they write about pirates or rescuing a dog from the mountains, all that matters is that they can resolve the story. They have three chances to do so. Before they write the middle of the story, your niece or nephew should write three possible endings to the story. Only then, do they have the chance to write their detailed descriptions and the wild journey to the finish. This helps them stay imaginative when problem-solving and gives them the chance to play with some lovely language. 5. Turn your niece or nephew into a Junior Reporter! While out for a day of fun with you, ask them to write an article about their experience. They can photograph the events that take place, jot down notes, and even do interviews. All of this can be done on an iPhone (even professional reporters use Voice Notes) or the old fashioned way, with a pen, paper, and a disposable camera. 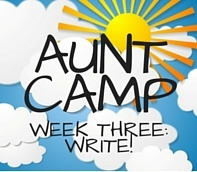 Home Activities AUNT CAMP 3: Write!